Create delicious hearty English breakfasts, authentic stir-frys and even desserts such as pancakes with the Tower 24cm Forged Fry Pan. Boasting a thick forged aluminium body in a lightweight design, this fry pan offers all the benefits of enhanced durability whilst also enabling easy manoeuvrability around your kitchen, suitable for all users. Its generous 24cm diameter makes it ideal for one or all the family whilst its silicone soft touch handle offers comfort and control during use. Suitable for all hobs including induction, this fry pan requires only a simple hand wash to maintain its optimum performance. I would definitely recommend this pan. It is easy to use and easy to wash up. Love it! It matches the Towers pots I have and cooks beautifully. Great quality as always Tower - thank you. a good quality non stick frying pan and not too heavy , would recommend. Best frying pan I have ever bought, wish I had bought it years ago. Hardly needs any oil when making omelettes, brilliant! 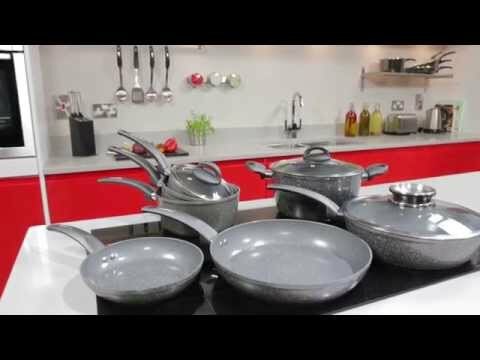 Great frying pan using the Cerastone ceramic coating. Very little (or no) oil needed and no sticking! Better than I expected. I love the frying pan. It is so nice to have something that does what it says on the "tin". Only used it a few times and already I love it. Best ever. I wish I had bought this type of pan years ago. Good well built product. Solid construction not like a lot of these pans which are very flimsy and light weight. Good value for the money. A great pan. The size is ideal for a cooked breakfast for one. The food does not stick and the pan washes really easily, far better than the pan I had previously. It has a solid stone like finish so looks good. A good purchase! Very impressed with this pan especially doing fried eggs they don't stick to the pan. Very good works well, excellent. I bought this frying pan to replace my old, traditional non-stick one that has ceased to be non-stick. It came at what I thought was a good price.\n\nTo date it has been great. The ceramic coating has surprised me by being at least as good as the older version. It seems to be well constructed. I have always been a bit wary of the older type of non-stick. I feel that the bits that flake off occasionally can't be doing me any good. The ceramic, I would think, wouldn't be so concerning.\n\nIt also works well on the induction hob I have. I bought this frying pan to replace my old, traditional non-stick one that has ceased to be non-stick. It came at what I thought was a good price. To date it has been great. The ceramic coating has surprised me by being at least as good as the older version. It seems to be well constructed. I have always been a bit wary of the older type of non-stick. I feel that the bits that flake off occasionally can't be doing me any good. The ceramic, I would think, wouldn't be so concerning. It also works well on the induction hob I have. I really like my new tower pan , food does not stick and it is very easy to clean. Delighted with the Forged Fry Pan. Wanted something not too heavy and non stick. Handle is comfortable to grip and hold.\nSome coatings say non stick but aren't very good. This pan is very good. Delighted with the Forged Fry Pan. Wanted something not too heavy and non stick. Handle is comfortable to grip and hold. Some coatings say non stick but aren't very good. This pan is very good.